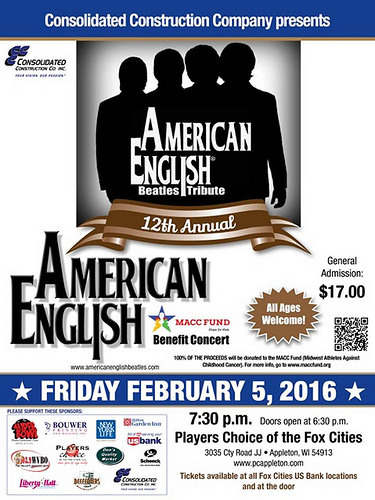 Make a date for the 12th annual “American English Benefit Concert for the MACC Fund.” The award winning Beatles tribute band returns to the “Players Choice” of the Fox Cities in Appleton, Wis., on Friday, Feb. 5, at 7:30 P.M.
American English is one of the finest tribute bands around. The musicians perform the familiar and beloved songs playing period musical instruments and wearing classic Beatles costumes. Listen to Oldies 103.9 WVBO for concert updates starting in January. Tickets are $17 at U.S. Bank locations through the Fox Valley and the participating Fox Valley Express Convenience Centers. This concert adds special meaning to the Beatles favorite “All you need is love” by the gift it has given to the children and the MACC Fund for a decade.